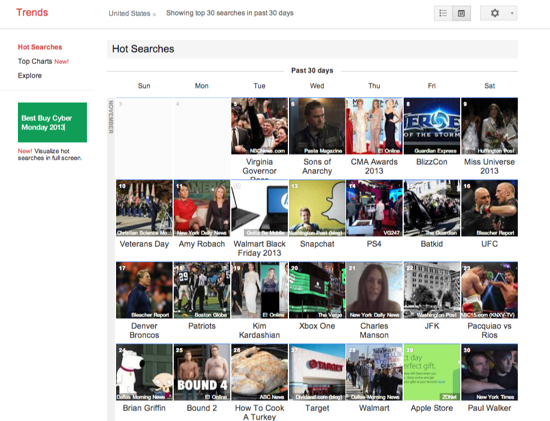 Google Trends is an awesome tool from Google that shows what people are searching for on any given day, the average number of searches the keyword/phrase are getting and a quick summary of why the topic is being searched on. This is something I focused on in an earlier post about how Miley Cyrus is using the internet and social media to explode her brand like never before. 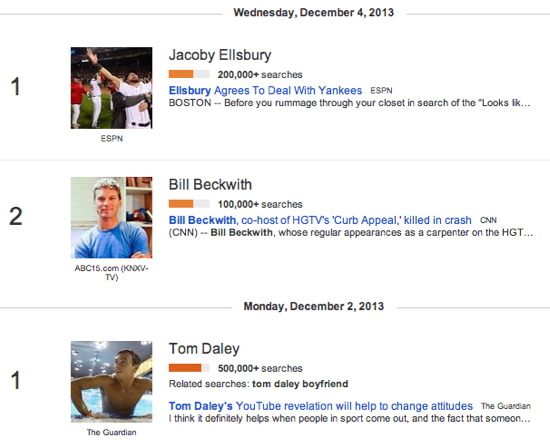 Here is a quick snapshot of what is hot today in Google search. Another cool feature of Google Trends is that they also allow you to look back in time and see what the most searched keyword/phrase was for a previous date. A great way to look at the previous month of search results is to sort by monthly calendar. While many people might think this is pretty cool and useful from a visual aspect, this information can be used to your advantage when creating ppc or social ad campaigns. People are searching for new things every day and once something gets hot and goes viral, there will be a lot of interest in it for a while. Build campaigns around topics that are hot today, but also don’t forget to look back at older trends and what attention they still have while many other outlets might have moved on to other areas. Google Trends is your friend and completely free. Use this awesome tool to your advantage and improve your ROI.